Developed to promote Shiroji as white as snow. 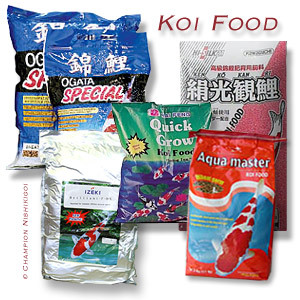 Includes uniquely selected ingredients eliminating those which might cause yellowing over time (Shiroji is the white areas of koi). A traditional Japanese health food extract of pickled Japanese apricot, naturally contains Apricot-Polyphenol and higher levels of Citric Acid which help maintain efficient metabolism in Nishikigoi, an important step in developing desirable Shiroji. Milled Sesame Seed contains desirable antioxidants which help develop improved gloss and luster. 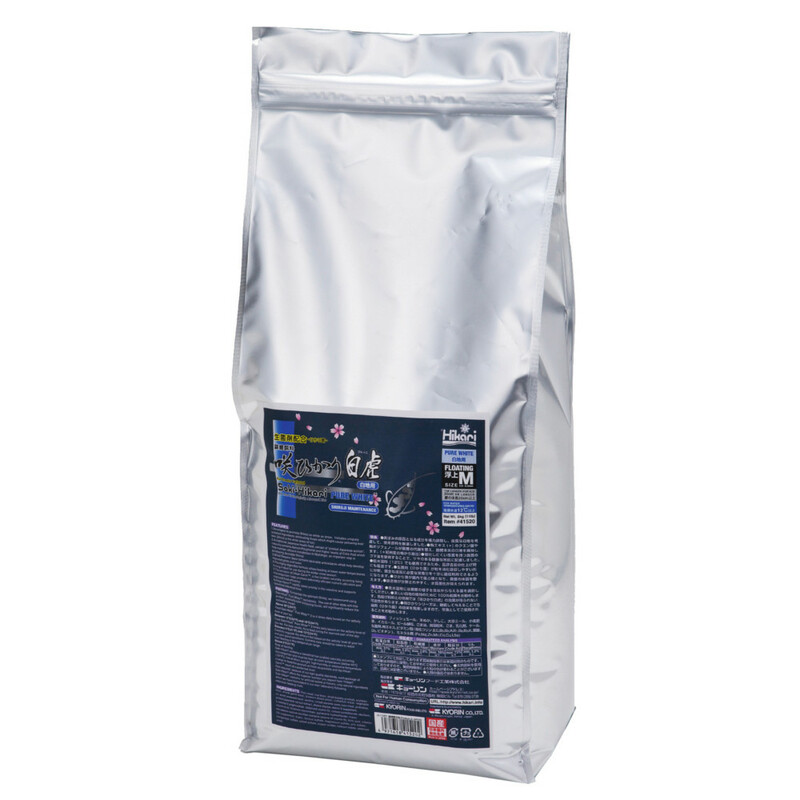 This highly digestible formula allows feeding at lower water temperatures making it ideal for use during the winter show season. The inclusion of Hikari-Germ™ probiotic, a live (viable) naturally occurring living microorganism helps promote extremely efficient nutrient utilization and improved feed efficiency. 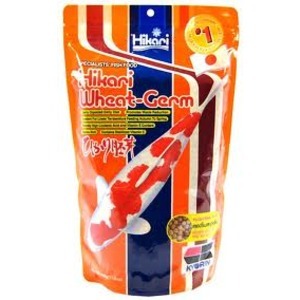 Hikari-Germ™ rapidly takes priority in the intestine and supports beneficial intestinal flora. The Hikari Germ™ is a source of live (viable) naturally occurring microorganisms which rapidly take priority in the intestine of the koi. It works to utilize the available nutrition working to reduce that which is available to bad bacteria thereby slowing their propagation. Additionally, Saki-Hikari™ offers your pet improved nutrient utilization through more efficient assimilation. This can translate into better water quality with continued use. To maintain optimum Shiroji, we recommend using Saki-Hikari® Pure White™ exclusively. The use of other diets with this product, especially color enhancing foods, will significantly reduce the noticeable impact. 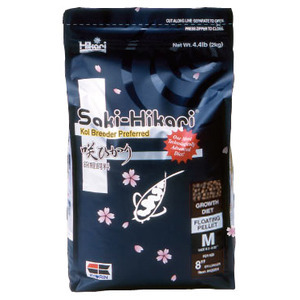 Above 18°C(64°F) Feed Saki-Hikari® Pure White™ two to four times daily based on the activity level of your koi. 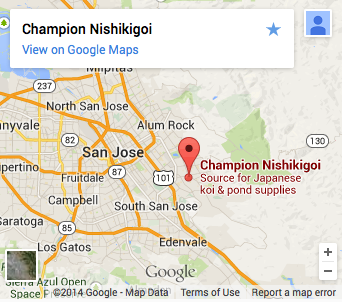 Between 12°C(54°F) and 18°C(64°F) Feed Saki-Hikari® Pure White™ two times daily based on the activity level of your koi. For best results, try to feed during the warmest part of the day. Between 5°C(41°F) and 12°C(54°F) Carefully regulate the amount fed based on the activity level of your koi and your pond conditions. Extreme care should be taken to avoid over-feeding in this temperature range. Below 5°C(41°F) Stop all feeding. Saki-Hikari® contains Hikari-Germ™ probiotic, a beneficial live (viable) naturally occurring microorganism and must be kept at room temperature (below 40°C(104°F), free of direct sunlight, high humidity or excessive temperature change to keep the product as fresh as possible and the Hikari Germ™ count at a preferred level. Rest assured, because of our rigid quality standards, each package of Saki-Hikari® offers the superior nutrition you expect from ®Hikari! Saki-Hikari® contains no artificial colors or flavors, only natural ingredients which we have formulated in our own laboratory following extensive feeding trials. Fish meal, rice bran, dried bakery product, soybean meal, wheat germ meal, brewers dried yeast, cuttlefish meal, vegetable oil, dried seaweed meal, lecithin, milled sesame seed, kale meal, probiotics (dried B. subtilis fermentation product), pickled japanese apricot extract, choline chloride, vitamin E supplement, L-ascorbyl-2-polyphosphate (stabilized vitamin C), D-calcium pantothenate, riboflavin, vitamin A oil, thiamine mononitrate, pyridoxine hydrochloride, niacin, menadione sodium bisulfite complex (source of vitamin K), folic acid, vitamin D3 supplement, biotin, ferrous sulfate, magnesium sulfate, zinc sulfate, manganese sulfate, cobalt sulfate, copper sulfate, calcium iodate, selenium yeast.